Edi96 wrote: Schumacher had the pace to win but would have retired anyway. Is the fuel pressure thing official? During the live broadcast (in French) they said something about a suspension spring getting loose, possibly as a consequence of the tangle with Grosjean at the start. Since the impact was sufficient to break the Lotus's rear suspension on the spot, I can't imagine Schumi's car wasn't damaged at all in the incident. Fuel pressure is confirmed, it had nothing to do with the start. Great that the car wasn't damaged at all after the first lap. Rear suspensions just aren't what they used to be. "Fresh off the back of a victory in Spain, Monaco specialist Pastor Maldonado is the one to watch. Now that we’ve said that, expect him to bin it on the opening lap"
One of the first accurate predictions of the year! Alonso: It depends what the F2012 is like but you know that Alonso will fight for every tenth of a second. Yes! Perez: The C31 looks like a handy car, so maybe Perez will be the surprise of the year? I think you're being a little unfair. That picture has to be taken in context. 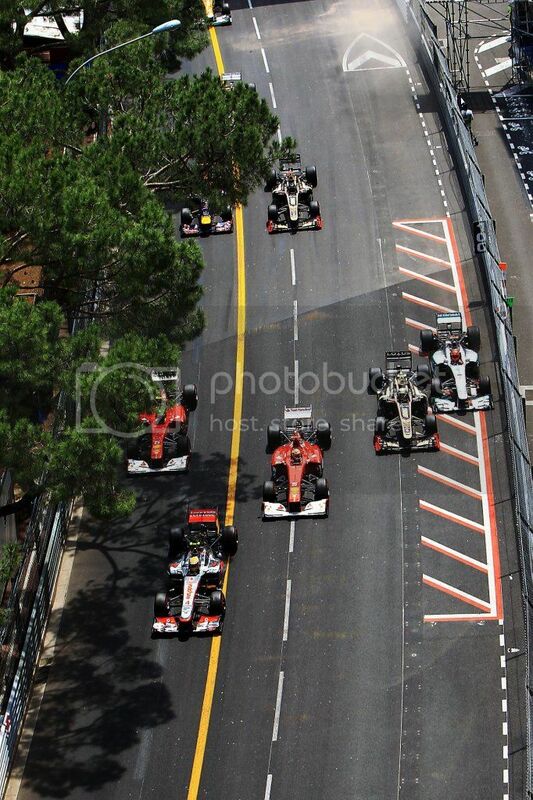 Alonso had shoved his way in to a gap that wasn't really there on a very tight bit of tarmac at OMG mph. The wheel contact with Grosjean shoved him over which in turn squeezed Schumacher. If the picture had been taken 2 seconds earlier it would look very different. Grosjean was the victim there. His only fault (a big one, though) was his poor getaway; as for the rest, you can clearly see from his onboard that Alonso moves right into his path and triggers contact, to which GRO reacts the only possible way to avoid an accident: had he slowed down, he would have sent Alonso spinning and/or gotten rammed from behind. It is also clear to see that Michael freaked out and backed down, for which he cannot be blamed; in hindsight, though, had he kept his foot down, the contact could have been avoided. Maybe. Who knows. Who cares? I believe it was just one of those incidents, although it was exacerbated by Grosjean's inexperience. What was remarkable was Webber's brilliant fast start, sealing off Rossberg's angled positioning threat and taking the lead. Webber has been notoriously slow on the starting grid. mileso wrote: What was remarkable was Webber's brilliant fast start, sealing off Rossberg's angled positioning threat and taking the lead. Webber has been notoriously slow on the starting grid. Just seen what Heikki did to Jenson (in the race edit). Lost a bit of respect for him actually.